In this intricate competing world, companies need to have a very clever & effective tactic for retailing & advertising so as to attract a lot of customers to their side. We understand that today, some firms want the systems of online marketing while others connect on to the regular practices of promotion like billboards, banners and print elements. If you prefer the popular broadcasting method, then you need to choose the best elements for the same. 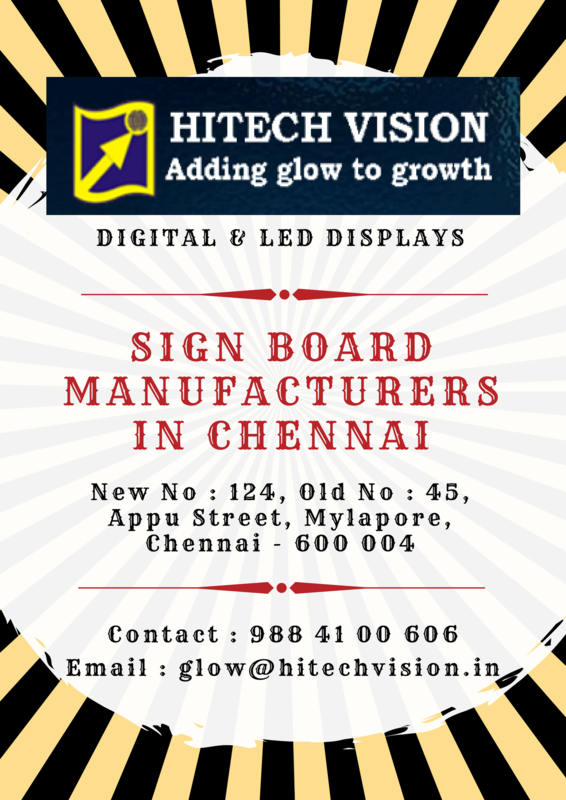 Inquire well about the Sign Board Manufacturers in Chennai like HiTech Vision & related other signboard manufacturers. There are numerous types of sign boards which can support to increase the market by pulling a lot of customers. There are Led Sign boards, 3D Signage Letters, modular signage, ACP Sign boards, Digital Signage, Etched nameplates, Outdoor name boards, Indoor display, Safety signs, Reception signage, etc. are the signage products manufactured by Name Board Makers in Chennai. These stocks not only help to grow the business but also long lasts for multiple years without making you contribute more on it. Apart from this, these signages from Metal Letters Chennai are a cost-effective and easy way of advertising the products. These sign boards can be installed in any high buildings, outer of office or shops, in reception or in any of the place where it can attract the concentration of people.